The project ‘Enhancing communities’ adaptive capacity to climate change in drought-prone hotspots of the Blue Nile Basin in Ethiopia‘ hosted a final workshop on 11 and 12 February 2013 in Addis Ababa. The project, which was launched in late November 2011, had about one year to “develop a learning site to help enhance the adaptive capacities of local communities to climate-change induced water scarcity” and to “provide evidence to governments to consider climate change and ecosystems in land use planning and natural resource management”. 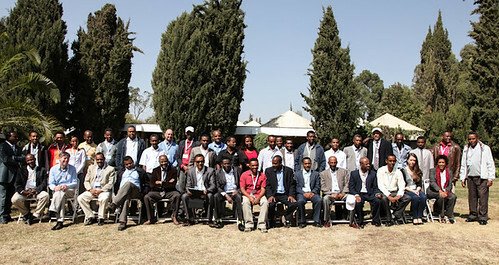 The site chosen was the Kabe watershed around Wollo. Cross-cutting issues (watershed mapping, capacity building, collective action). On the second day, they identified what interventions could be scaled up, how they could be scaled up (building on the approaches tried out in the project) and what a next phase of this project might look like. Throughout the workshop, the digital stories that were developed as part of this project were shown to illustration some of the project’s findings. The United Nations Environmental Program (UNEP) which funded this project is interested in a more ambitious second phase of this project. Some of the lessons learned through the project and summarized in the workshop will hopefully see other useful applications soon.